When you want to hang out, relax in and simply spend some time in your garden, you are going to need to buy yourself some garden furniture. Garden furniture comes in a wide range of styles, shapes and sizes and if you are looking for something simplistic then wooden benches might just be the look that you want to go for. But just because you have narrowed your choice in garden furniture, by picking a wooden bench. That doesn’t mean that your choices are limited. 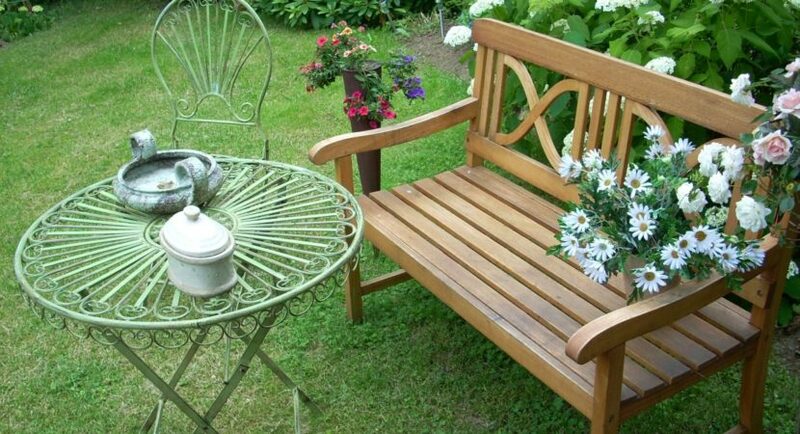 In fact, there are a variety of garden benches that you can choose from for your garden. To help inspire you, we have put together 3 different garden benches, all of which could be the ideal addition to your garden for the Summer months. Like the idea of being able to sit out in your garden, but not 100% sure that you like the idea of having to sit directly in the sun whilst you are out there? If this is true for you, then an Arbour style garden bench is likely to be the perfect choice. Combining a spacious bench (often enough for two people) it also comes with a wooden canopy over the top of the bench. This helps you to stay cool, even when you are sat reading your book or simply just sitting out in your garden watching the world go by. Whilst we think that Arbour seats are beautiful in their own right, one thing that we have seen online, which we think is a great idea is to install fairy lights around the top of the arbour. Which gives a wonderful look in both the night time and day time too. Some of us love to sit alone in our gardens. Whilst some of us like to enjoy the time with someone else. If you are a sharer, rather than someone who goes it alone, then you may find that a couples bench seat is the ideal addition to your garden. Whilst the majority of benches are designed to contain more than one person, the beauty of this particular design is that it gives everyone their very own space to sit in. Not only this, but you also often will find that these benches come with a table in between the two seats. In essence, you have a complete garden furniture set, without having to worry about it taking too much space. If you want something that is simple, perhaps for the end of the garden, then a backless bench is the ideal choice. Sure, it might not be as comfortable as a bench that has a backrest, but it is ideal for blending seamlessly in with the rest of your garden. Rather than standing out. We think that these style of benches work best in an area where you may spend a shorter amount of time. Perhaps near to a bird bath or a planting area. As this will give you the ideal place to sit and take in everything that is going on around you. Why buy a garden bench? With so many different styles of garden furniture out there, what makes garden benches such a great choice? We love the fact that they are simple, yet stylish. Whilst they offer a great place to sit down and relax, they blend seamlessly into the rest of your garden. Ideal if you like the natural look. They are also well adapted to the weather too. Although, you may find that you need to keep on top of cleaning your bench, as well as treating it with appropriate products to ensure that it always looks in tip top condition. The thing to remember when choosing garden furniture, particularly wooden benches is that there is always plenty of choice for you out there. The trick is to take your time, shop around and really think about what you want and where you want it to be in your garden. In no time at all, you will have the perfect place to sit and relax as well as a high quality piece of garden furniture that is going to stand the test of time.